Etiology: DNA containing Varicella-Zoster virus. 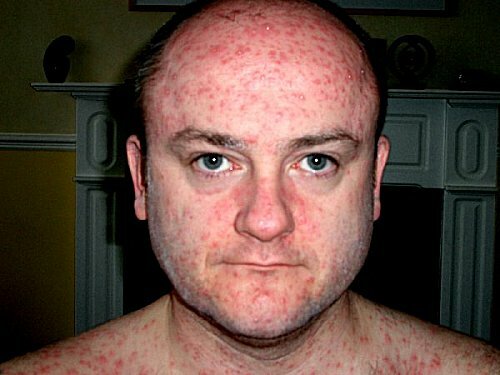 • Source of infection – ill person with chicken pox, (rare – herpes zoster). • Chickenpoxis is transmitted from person to person by respiratory route or by the direct contact. • Susceptible organism – everyone, who didn’t ill before. 1. Inoculation of virus and it’s replication in epithelial cells of upper respiratory tract. 2. With lymph it enters to the blood and viremia develops. 3. Damage of the skin epithelium and mucosa epithelium. 4. Damage of the nervous system – (intravertebral ganglia, brain and cerebellum cortex, subcortical region). 5. Generalization of the infection (damage of liver, kidneys, lungs) in immunosupressed people. • The incubation period ranges from 11 to 21 days (most cases 14-17 days). • The contagious period extends from 1 to 2 days before the rashes erupt until all of the lesions have crusted (5 days after the last rashes have appeared). • The prodrome consists of 1 to 2 days of fever, headache, malaise, and anorexia. • The rashes, often pruritic, begin as a maculae and progresses rapidly through the stages of papule, vesicle (photo 12), and crusted lesion (photo 13). The spots first appear on the face or trunk, obvious on the scalp (photo 14) and, at the height of the illness, are more numerous centrally than distally (photo 15). In severe cases may be present on palms and soles (as spots and papules) (photo 16). The lesions erupt in crops for 3 to 4 days (sometimes to 7 days) and it is characteristic of the rashes that lesions in different stages of development may be found on one area (false polymorphism) (photo 17). The vesicle is a 2 to 3 mm oval filled with clear fluid surrounded by an erythematous base. The fluid clouds and a crust forms appear within 1 day. Lesions occurring on the mucous membranes do not crust but form a shallow ulcer (photo 18, 19). Posterior cervical lymph nodes usually are enlarged (photo 20). The congenital varicella syndrome in case of infection in the 1st trimester of pregnancy by VZ-virus – may occur embryopathies. Maternal varicella 5-10 days before delivery result in mild chickenpox in newborn from the first days of his life. Maternal varicella 4 days or less before delivery may result in severe disseminated or total chickenpox in the newborn. or due to immune globulin or plasma injection in the latent period (not numerous rashes as papules with several vesicles appear, body temperature is normal). - Bullous: together with typical rashes appear large vesicles up to 2-3 cm with cloudy content, after them erosion and pigmentation develop. - Hemorrhagic: develops in immune compromised children, vesicles content become hemorrhagic, crusts are black. Other signs of hemorrhagic syndrome are present (petechia, ecchymoses, nasal bleeding, hemorrhages into the inner organs). - Gangrenous: develops in immune compromised children in case of bad care. Vesicles content become hemorrhagic with infiltration around them, crusts are black,ulceration is typical. - Generalized (visceral) is typical for the newborns and in case of the immune deficit. · Complicated by secondary bacterial infection as lymphadenitis, pyodermia (staphylo-and streptodermia), erysipelas, phlegmon, abscess, sepsis. - Secondary bacterial – infection of lesions (with staphylococci as pustulosis (photo 21) or b-hemolytic group A streptococci as erysipelas, phlegmona (photo 22) are the most common complications; also may be otitis, pneumonia, lymphadenitis, stomatitis, purulent conjunctivitis and keratitis, sepsis, osteomyelitis. - Viral: Primary varicella pneumonia affects immunocompromised patients and up to 35 % of normal adults; croup; Encephalitis follows varicella in fewer than 1:1000 cases (involvement of the cerebellum, or cerebrum), meningoencephalitis, encephalomyelitis, less common – Guillain-Barre syndrome, transverse myelitis, optic neuritis, and facial nerve palsy. - Rare complications: idiopathic thrombocytopenic purpura, nephritis, myocarditis, arthritis, acute adrenal insufficiency because of adrenal hemorrhages. • Virological separation of the VZ-virus on embryonic cells. ·Beginning from a general infectious signs (malaise, anxiety, absence of appetite), dyspepsia phenomena. ·Body t° is normal or subfebrile, grows when rashes appear. ·Rashes appear on 2nd-5th day, massive, sometimes remain in one phase of development (gradual development of illness). · Frequent is secondary bacterial infection. · The severe form of disease, when appears need in undertaking of intensive therapy; patients with moderate forms at age before 3 years. 7. Sick children from families with bad social-home conditions, especially in the event of impossibility of their isolation to prevent infections transmission. 8. Absence of conditions for examination and treatment at home. 9. Sick children from closed children institutions. 1. Possibility of additional infection by hospital bacteria is completely excluded. 2. Realization of individual care principle for sick child is more full. 3. Avoiding stressful reactions, which could appear in case of hospital treatment. 1. In conditions of isolated flat. 2. In case of satisfactory material position of the parents. 3. In case of parents desire to organize individual care and treatment at home. • Acetaminophen for fever control. n And Severe forms of Chicken pox (Acyclovir orally 80 mg/kg/day 4 t.d. for children elder than 2 years and teenagers). Also for severe cases in neonates – Varicella-Zoster immune globulin (0.2 ml/kg). • In meningitis IV acyclovir 10-15 mg/kg 3 times per day during 5-7 days. • In case of CSF hypertension – dehydration by 25 % MgSO4 IM, lasix 1-3 mg/kg IV or IM, acethazolamid orally. in 3-5 mg/kg IV. Dehydration therapy: lasix 2-3 mg/kg IM or IV. 1. To isolate ill person until the 5 day after the last vesicles has appeared. 2. To isolate contacts from 11 till 21 day after exposure.